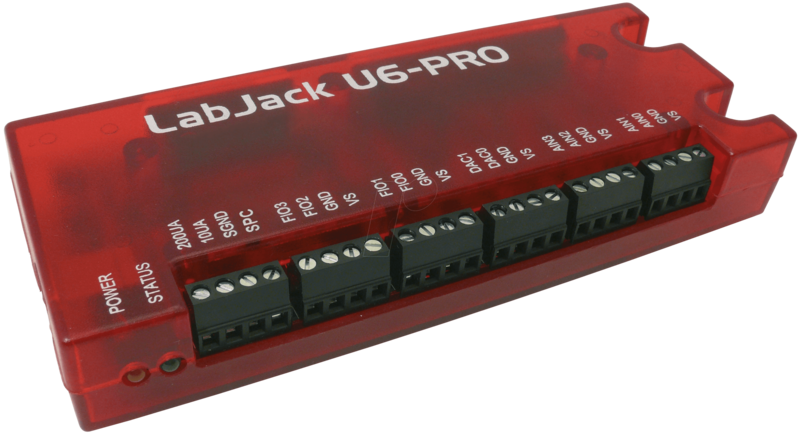 The LabJack U6 is a complete, compact USB mini DAQ lab module. The U6 has analog inputs with a high resolution of 18 bit (depending on speed), 12 bit analog outputs, digital channels and counters. The version LabJack U6-Pro has a high precision 24 bit low-speed converter. 14 analog inputs (16 to 18 bit depending on speed). Model LabJack U6-Pro with 24 bit low-speed A/D converter for an effective resolution of 22 bit. 14 single-ended or 7 differential inputs. Range ±10 V, ±1 V, ±0.1 V.
Internal temperature sensor for CJC/cold junction compensation. 2 fixed current outputs (200/10 µA). 2 analog outputs with 12 bit resolution, range 0...5 V.
Up to 4 counter/timers for pulse timing, PWM/puls width modulation, quadrature input etc. Supports SPI, I2C and asynchronous serial protocols (master only). Max. input streaming rate 50 kHz depening on resolution. Screw terminals, 37- and 15-pin D-sub female connectors. PC connectivity via USB 2.0. USB-powered.